What is Amace-BP (Benazepril HCl/Amlodipine) used for? Amace-BP is indicated in the treatment of hypertension (high blood pressure). Amace-BP causes the blood vessels to relax, which allows the blood to flow more easily and reduce blood pressure. The active ingredients in Amace-BP are Benazepril Hydrochloride and Amlodipine Besylate. Benazepril is an ACE inhibitor and Amlodipine is a calcium channel blocker. How should I use Amace-BP (Benazepril HCl/Amlodipine)? 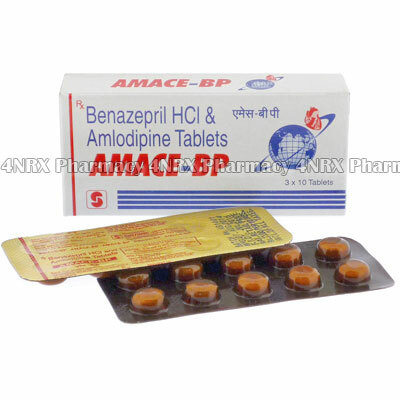 Amace-BP is tablet form with 10mg of Benazepril and 5mg of Amlodipine per tablet. Each strip contains 10 tablets. Most people will require a dosage of one tablet daily. Your doctor may have prescribed you a higher or lower dosage depending on the level of hypertenstion. What are the side effects of Amace-BP (Benazepril HCl/Amlodipine)? The most common side effects associated with Amace-BP are a dry cough or swelling in your hands feet and ankles. Because of the reduced blood pressure, you may notice that you feel light-headed or dizzy, especially when you stand up or sit up from lying position. Rising slowly can help alleviate this problem. More serious side effects include muscle weakness, a heart beat that is faster than usual, a heart beat that is slower than usual or a heart beat that is irregular. Notify your doctor immediately if you experience any of these. People with an allergy or hypersensitivity to ACE inhibitors or calcium channel blockers, should not take Amace-BP. Diabetics who are using Aliskiren should not combine this with Amace-BP. People with heart conditions, kidney problems, liver problems, diabetes, systemic lupus erythematosus (SLE), scleroderma, or a collagen vascular disease may not be suited to treatment with Amace-BP.